In three different deep prep bowls, put the egg whites, basil and oregano, and bread crumbs. In a large saute pan that is oven safe and has a lid, heat the olive oil over medium heat. While the olive oil is heating, dip each chicken breast into the egg whites, then the herbs, and then the bread crumbs, making sure to cover each side well. Put the coated chicken breasts into the heated olive oil. Let simmer and then flip, about 3 minutes each side. Pour about one half cup of your favorite marinara sauce over the chicken. Cover the chicken and place in the oven at 350 degrees for about 15-20 minutes, until the chicken is cooked through. 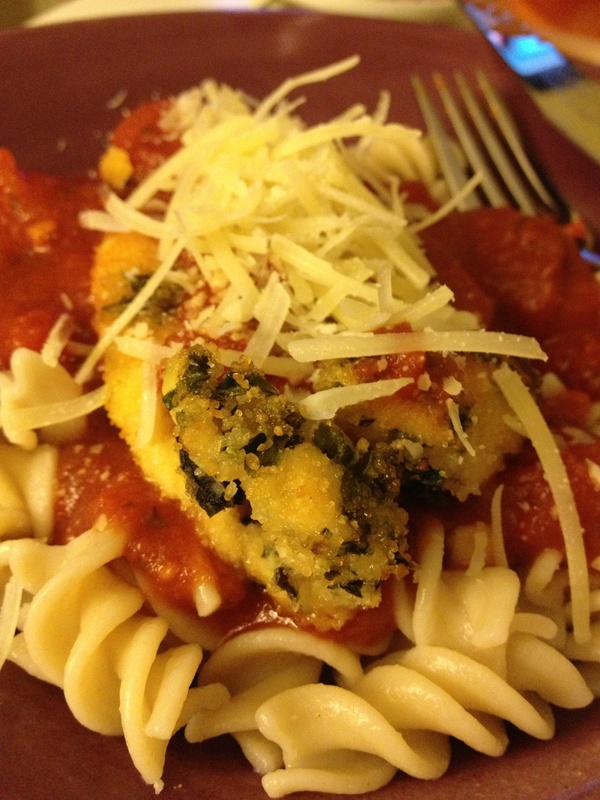 Serve over your favorite gluten free pasta and sauce, topping with parmesan cheese.